You must make reservations at least 5 minutes in advance of the time at Shoal Creek Tavern. We have a large parking lot behind the restaurant. Also the Shoal Creek Shuttle is here to help you in bad weather when you are just to full to walk to your car. For your convenience the Dart rail /DCTA has a bus stop here. Life has many things to celebrate. Our family at Shoal reek is here to help you enjoy any event from birthdays or anniversaries to corporate networking meetings. Enjoy our chef-inspired menu or let our team work with you for something tailored to your specific tastes. Our open-seating bar has 50+ beets on tap, an extensive wine menu, spirits, and hand crafted specialty cocktails. We look forward to greeting you with a warm welcome, creating memorable moments, and seeing you off with a fond farewell! Shoal Creek Tavern is a family owned & operated upscale Gastropub in Highland Village, TX. We are a scratch kitchen and can accommodate any food allergy or dietary restriction and have many gluten free options available. We have two temperature controlled patios complete with fireplace and water fountain great for private events such as graduations, rehearsal dinners, or company outings. There are 50+ specialty beers on tap, 30+ wines. Known for the best smoked old fashioned in Denton County. House made mixers, juices even our bitters are made in house. Elegant and uniquely craft cocktail Menu. Spirits from all over the world and our own backyard. Happy Hour and $3.00 drink specials. Chef crafted four course wine dinners. We have and 19 large HD flat screen TVs. Full Sunday Ticket for all your football watching needs. Open for lunch, brunch, dinner and most Holidays. Unique chef lunch and dinner specials created daily. Ample parking & the Shoal Creek Shuttle for bad weather. The food, presentation and atmosphere were great. Definitely get the bread appetizer...delicious! I ordered the stuffed chili rejenno, and it was very good as well. Visited with 2 friends to celebrate a birthday and just catch up. Service and food was excellent and wine and drinks were very good. We had three different meals and each one was very good with nice presentation. I had the pork chop and is was excellent. Very limited noise level, good for talking. Staff was very good at paying attention to our needs but not interrupting our conversion or meal. I would recommend this place to another looking for a good meal and good wine list. Outside on the patio was a bit noisy. Next time we'll ask for a table inside. Otherwise, an enjoyable experience. Great place to dine with friends. Food,drinks and service were excellent. Will definitely be going back. Excellent brunch menu! There were 4 of us and everyone ordered something different and everyone liked their choice. It is a great atmosphere and reasonably priced. Highly recommend! Shoal Creek always has great food and terrific specialty cocktails. The smoked old fashion is my personal favorite! 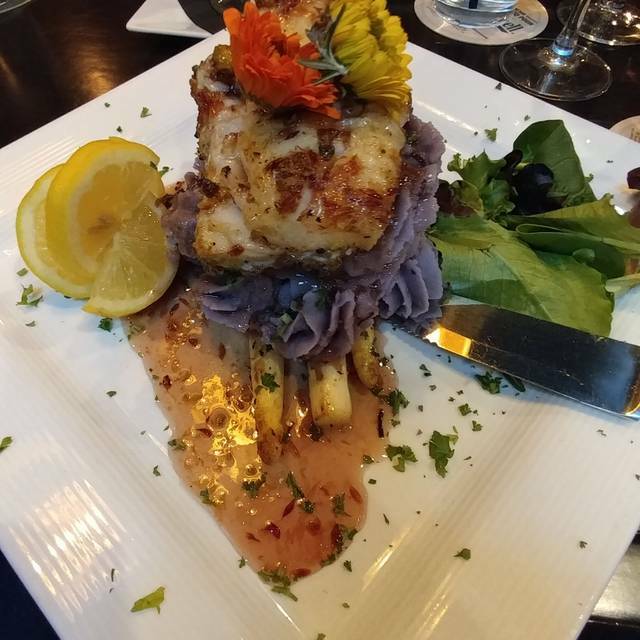 Great food, fantastic service and decadent drinks. 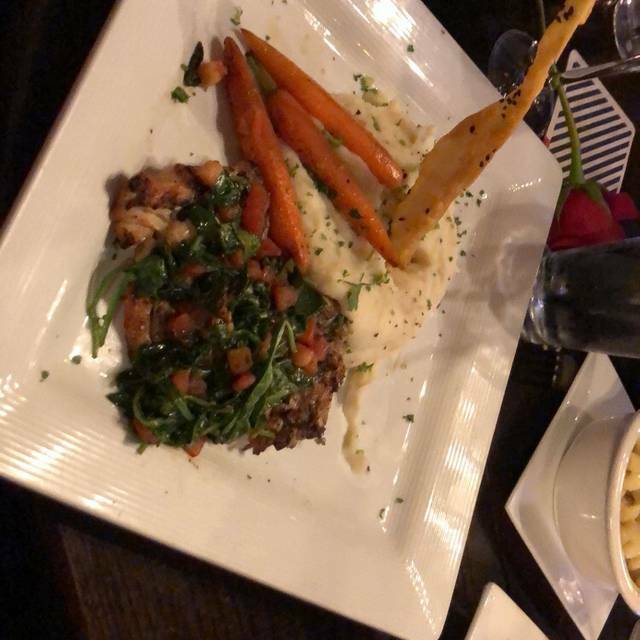 We had a very nice time here, the food was great, portions generous, price was very reasonable for the quality and amount, and service was timely and accurate. We will be returning again shortly! Great food, great service! We had reservations on NYE, and we were seated right away. Watermelon martini was yummy. We started with the Shoal Creek Bread as our appetizer. Husband had the strip, and I had the pork chops. Both were delicious. We will be back! Great Service! Great food! They are very welcoming and accommodating. A great local spot serving very nice bar menu, with bartenders who really know how to make a drink, combined nicely with a very good assortment of food to select from all prepared at a high level of quality. This clearly a well run, well managed, well maintained local gem. The owner should be proud of his/her place. First time my husband went, have to say it was great food, great service, and the service was spot on! We had reservations for Christmas Eve dinner...I can't say enough about our entire experience from hostess greeting to settling our bill. Wow. Every single person who came to our table was friendly and looked to be working as a team and enjoying their jobs. We never felt rushed even though the restaurant was packed. We had a party of 5 with 5 different entrees and we each loved our meals. Will definitely return and recommend! Great job Shoal Creek Team! Never had a bad meal or experience we Shoal Creek. Great food, great service, great value! So...this was our 5th visit. We were seated at 6:20, served by 7. A little slow this time, but the meal and service did not disappoint. We tried a new item- for us. The carne asada steak was amazing and the corn was the sweetest I’ve ever had. My bride had the bone-in pork chop. It’s become our favorite stop for dinner. Price for two is usually about $50. Portions are wonderful. We often take a little home. Love this restaurant! Fine dining and presentation without the price! Only our fourth time here. Has consistently been great. The service and food were outstanding. I took a chance on this place having never been before, suggesting to friends and co-workers we meet here for dinner and drinks, and it paid off. Everyone loved it, myself included. As always, the service, food and beverages were excellent. It is a bit expensive, but worth it. Food is creative and delicious. Staff is attentive and awesome. Brunch menu was great! Our first time to visit and we were not disappointed. Were able to have a really nice meal and watch football in bar area. The food is consistently great. The service is as well. Tonight, we got walked, after being seated and presented menus, to a different section of the restaurant to accommodate a 7 top arrival. We were put on a tiny two-top against the wall in the N side of the restaurant. Not a good move for us, but they were visibly paying each other props on this accomplishment. Despite this, the food didn’t disappoint nor did the server. Well worth the value. We used Open Table to book our reservation, so we were seated right away. First visit and the food was very good! Unusual, eclectic menu and all 4 entrees were beautifully prepared and delicious. We will be back! This is your neighborhood bar elevated to a fine dining experience. While pricey, the menu offers an array of options and the portions are quite large. My husband and I frequent the bar as they have a fantastic wine list and make craft cocktails. His favorite is the Smoked Old Fashion with Whistle Pig Rye. If you sit in the bar, ask for Emma or Nick; they always do an amazing job. Really, all the bar staff are knowledgeable, attentive and make fantastic drinks and recommendations. Never got the opentable reservation. Food was great. Drinks were small for the price. Warm greeting when we walked in - immediate attention from the bartenders but that dropped off as the night went on. We were there less than an hour before close which always makes me wonder if getting ready to close is more important than serving the customers still there. That aside however, we had the crab stuffed shrimp and chili relleno and both were very good! Cool atmosphere and tons of beers on tap. I would come back for sure!